As far as organic gem accessories are concerned, black pearls are by far the most elegant choice available on the jewelry market. A pair of black pearl earrings, a black pearl bracelet or necklace can make any outfit shine because they truly are a touch of sophistication and refinement. But there is much more to black pearls than meets the eye. These gems are fabulously complex and they have a series of outstanding characteristics that make them stand out on the market. Let us tell you a bit bout black pearls and the main types of jewelry made with these gems so that you can get an idea of their immense complexity. Black pearls are organic gems developed naturally by mussels. The vast majority of pearls are white, with an immense variety of colored overtones. Black pearls are quite rare, as there are only a few mussel species that are able to create pearls of this color. Like white pearls, black ones also come with an impressive variety of metallic overtones that convey them a diverse pallet of shades and glow types. Because black pearls are in high demand on the jewelry market, scientists have developed creative methods to increase the availability of these majestic gems. As such, white natural pearls can now be colored artificially to mimic the natural shades of black and the diverse overtones of natural black pearls. Moreover, black pearls can now be completely developed in a laboratory. Nowadays, artificial pearls are in high demand in the fast fashion sector. Natural black pearls are among the most valuable types of pearls on the jewelry market. Their main contenders are round large pearls, which are the display standard in the pearl series. Here are the main types of natural black pearls so that you know what you need to look for on the market if you are interested in this type of gem. Tahitian pearls are the most valuable black pearls available on the market. They come in large sizes of up to 17mm and they feature an impressive pallet of metallic overtones, ranging from silver gray to greenish yellows. The most appreciated type of overtone is a rainbow-like glow called orient. Freshwater pearls are the most accessible type of pearls in the entire pearl series. As for other types, most of them are white and pink, while only a small part of them are black. These pearls come in small sizes, which makes them accessible in price and impressive in quality. 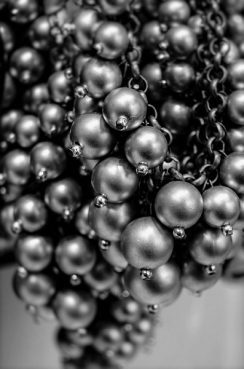 Due to the increased demand for Tahitian black pearls, jewelers have developed alternatives that could provide buyers with more affordable prices and a vaster array of alternatives. Artificially colored natural pearls are the perfect compromise between value and affordable pricing because the gem itself is natural and thus, valuable, but the color is artificially shifted to those rare shades of black. White Akoya pearls can be shifted to appear black by making use of a series of coloration techniques targeted to shift the color of the pearl’s nacre. Artificially colored black Akoya pearls are more accessible in price than Tahitian pearls. Nacre-targeted coloration techniques can preserve the main natural characteristics of the pearl, which sets artificially colored natural pearls from fully lab-made pearls. Freshwater pearls can be shifted into any given color through artificial coloring techniques. As opposed to Akoya pearls, which are quite expensive, freshwater pearls are significantly more accessible. They provide buyers with affordable choices for notably qualitative gems. Artificial black pearls are extremely useful for the fast fashion industry. They mimic the natural shape and color of black pearls but their price is much lower than that of natural pearls, thus making this type of gem accessible to a wide range of buyers. Black pearl earrings are key accessories that any woman would love to have in her jewelry box. They can provide a unique type of elegance to a wide range of outfits. Their impressive versatility makes them fit for casual outfits, as well as formal ones, thus providing women with a broad array of elegant looks. Here are the main types of earrings available on the market. Black pearl stud earrings are classic jewelry pieces that are compatible with a virtually endless array of outfits. While freshwater black pearl earrings are perfectly suited for casual outfits, black Tahitian pearl earrings are the ideal fit for formal attire. There are quite a few types of black pearl stud earrings available on the market. Ranging from the classic single pearl model, which comes with a gold or silver stud, and all the way to gold or silver ornaments around the pearl, which can also include diamond or moissanite additions, black pearl stud earrings are immensely versatile and extremely easy to pair with virtually any outfit. Hoop black pearl earrings are the most versatile type of pearl earrings because they can provide an immensely elegant, yet joyful touch to any given outfit. Depending on the size and shape of the hoop, these black pearl earrings can be styled into casual, as well as formal outfits. Tahitian black pearl earrings remain the most elegant option, while black freshwater pearl earrings are the most adaptable ones. Baroque black pearl earrings are the most creative pieces in this sector of the jewelry market. Ranging from unique black pearl drop earrings featuring a wide array of impressive shapes and sizes and all the way to pieces featuring metal-knotted strands, baroque pearls are guaranteed to catch anybody’s eye. They are the adventurous option because these pieces include extravagant models as well as a wide variety of unique pearl shapes. Black pearl dangle earrings are distinguished accessories suited for any given formal outfit. They are ideally suited for evening gowns, cocktail dresses, and formal attire because they are a delicate touch of luxury that can enrich a woman’s look in a truly unique way. Black pearl earrings with diamonds are the standard of luxury in this sector of the jewelry market. The Tahitian black pearl earrings yellow gold combination is yet another delightfully extravagant choice that women can appeal to. We hope we have managed to provide you with the key information about black pearl earrings and that you are now ready to explore the jewelry market to find the ideal fit for you. These pieces are bound to be instant favorites because you will be able to wear them on a wide variety of occasions.